A classic design that stands the test of time. This traditional style kitchen is influenced by the Shaker movement, who were highly-skilled craftsman, their guiding principles were simplicity and efficiency in creating minimalist designs. The Shaker style is an iconic symbol of a period of modest simple handmade furniture. Many products produced by the Shaker community revolutionised furniture design and manufacturing. A Shaker kitchen is proven to be a timeless style that will continue to hold aesthetic value for many years to come. 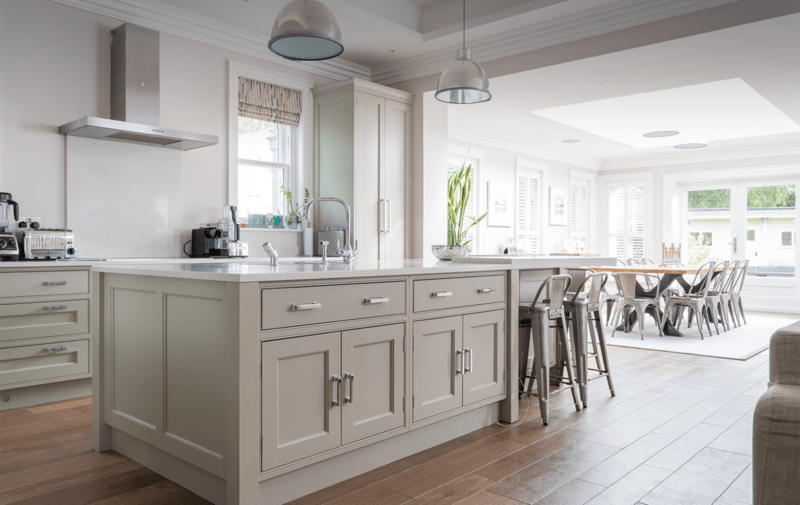 A Shaker style kitchen is built with an emphasis on practicality and durability. However, don’t go thinking a kitchen style focusing on functionality can’t also add a touch of class to your home. Shaker’s are based around the model of square framed proportioned doors with recessed panels, featuring clean straight lines. Our designers use simple and straightforward techniques to bring out the elegance of this classic handmade kitchen, with recessed plinths and simple cornice detailing. A square pilaster completes the finishing touch, and enhances the angular unassuming period style that will never date. Our designers use simple and straightforward techniques to bring out the elegance of this classic handmade kitchen, with recessed plinths and simple cornice detailing. Using the Shaker style, our craftsman are able to develop the design into handmade furniture such as wardrobes, bookcasing, sideboards, media cabinets and more.